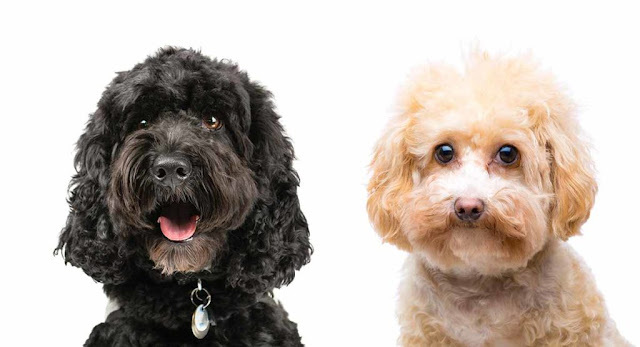 Poodle dogs are divided into three different types: the miniature, standard, and toy. The American Kennel Club, an authority on dog breeds, defines the varieties by size. Standard poodles should be more than 15 inches at the top of their shoulders. Miniature poodles are defined as 15 inches or less at the highest point on the shoulders and more than 10 inches. Toy Poodle should be measured at 10 inches or less at the highest point of the shoulders. Standard poodles were the first variety of the poodle dog breeds. It was created to retrieve waterfowl for hunters. The name "poodle" was probably derived from the German "pudelin", which means splash in the water. A lot of people think of the poodle cut as something invented for pampered little dogs to appear pretty, but it was really invented for standard poodle in its original function as a water retriever. The rare coat has been cut off to allow the dog to swim better while leaving the chest hair intact to protect its vital organs from cold water. The pom on the dog tail and the bow on the head were used to assist the hunters locate and spot their dogs in the water. The standard poodle size has made it useful in many other capacities. Poodles have been trained as guide dogs, guard dogs, army dogs, hunting dogs, even as sled dogs. Prince Robert of the Rhine, the cousin of Charles I of England, had a white standard poodle named Boy, whom he took to battle with him, who died in 1644 at the Battle of Marston Moor. The Emperor Napoleon mentioned in his memoirs a standard poodle that died in the battle of Marengo. During the Second World War, standard poodles were used in the United States to protect military installations and coastlines. Because they are hypoallergenic, poodles make a good guide dogs for blind people with allergies. The miniature and toy poodles were bred during the Renaissance, when European nobles wanted little dogs for their companions. People carried little poodles around in their sleeves during cold weather. To this day, miniature and toy poodles are seen as companion dogs often carried around in bags or suitcases. Small poodles were used to find any type of fungus called truffle because they would disturb the ground less than the larger once. Small poodles were trained by gypsies to perform tricks and were used in circuses and vaudeville. The two types of poodles not recognized by the AKC are Klein and tea cup poodles. The Klein is medium height between the standard and miniature, with a height of between 15 and 20 inches at the top of the shoulder. The Kleins, or moyens, as they are known in France, are generally kept as pets in American homes because of their inability to compete in AKC shows. Tea Cup Poodles are the smallest and measures just nine inches at the highest part of the shoulder. They usually weigh only six pounds or less. Whatever its size, poodles are known to be one of the most trainable and intelligent dog breeds,. If you purchase a poodle, train it early and socialize it early to have a happy companion.